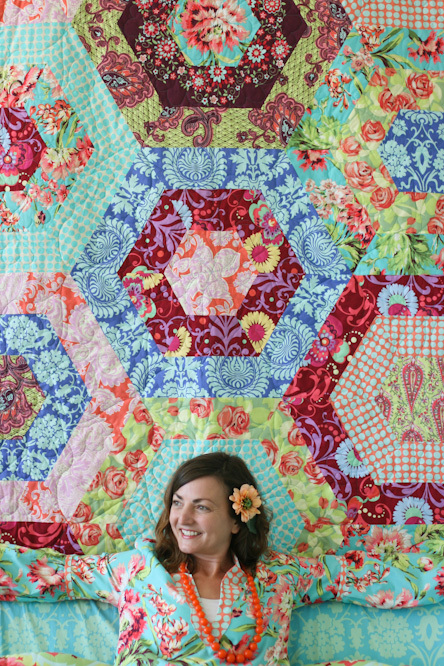 Lori Danelle: maker of things: Attention all Fabric Junkies!! AMY BUTLER HAS A NEW FABRIC LINE OUT!!!! I almost wish I hadn't just purchased a ton of new fabric because this stuff is BEAUTIFUL! In actuality, I want to keep all the fabric that I have and just get more!! You have to go check it out—she's calling it LOVE. While usually the quilting & fashion line is it's own line and the home decor line is completely separate with it's own designs, she has BOTH this time!! So if you really want to, you can cover your couch to match the new dress you just sewed! Quilthome.com announced in their newsletter this week that they will be having a special sale on the new line NEXT week. . .so definitely check that out if you have some money to spend on fabric. . . or you could loan it to me. If you need me, I'll be over at Amy's site, feasting my eyes on her amazing designs. . .
Look what Big Sister got into. . . I'm really not this boring!